GA Grown Trail 41 Association, Inc.
A Tour Booklet is available for purchase at the Vienna City Hall or the Georgia Cotton Museum for only $5.00. If you are looking for the "ultimate southern experience" you will find it in Vienna, Georgia, founded in 1841. The city is named after the Austrian capital but pronuced "vye-anna". Why people ask? "Because we're in the South, that's why!" This small city offers a quiet, friendly small town atmosphere steeped with local culture and tradition. You'll easily find fine antiques at great prices, unique collectibles, beautiful historic homes, and prime hunting and fishing opportunities, both in and around Vienna, Georgia. Of course, you cannot forget the barbeque! Vienna is home to the BIG PIG JIG®, Georgia's official Barbeque Cooking Championship. Barbeque is not our only call to fame. You can delve into a rich history and culture and learn about Vienna's most notables - from a Hollywood screen writer, an Olympic athlete, governors, senators, poets, authors, and artists. Vienna has produced its share of unique and famous individuals. You will see some of their homes on the self guided tour. On January 28, 2005, all of downtown Vienna and the older immediate outlying neighborhoods were listed on the National Register of Historic Places. THat same year City Officials designated a large portion of this area as a Local Historic District and appointed the Vienna Historic Preservation Commission. 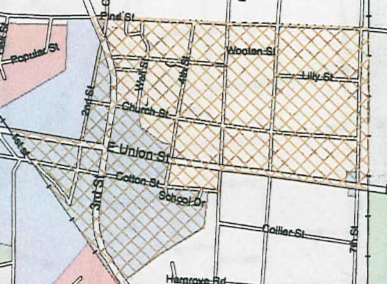 Please note that the National Register District and the Local Historic District boundaries are not exactly the same. A Tour Booklet is available for purchase at the Vienna City Hall or the Georgia Cotton Museum for only $5.00. The Historic District is shown on the map below.